Easter Ski Holidays in the 3 Valleys are definitely our favourite of the season! Where Better for your Easter Ski Holidays? Easter ski holidays generally begin with a great deal of ski resorts overbooked in the February half term, and with the clampdown by schools on term-time getaways, more and more families are looking to take advantage of great Easter Ski Deals to enjoy their family skiing holiday at Easter. Easter is our favourite time of year to enjoy a ski holiday. Whatever your skills on the slopes and whatever the location you’re looking to ski; from the French Alps to Lapland there are plenty of great ski resorts to choose from. However, the key ingredient when skiing in April over Easter is making sure you opt for somewhere that still has great snow. High altitude ski resorts are what you need to ensure great snow conditions. The Three Valleys is not only the largest linked ski area in the world but it also has the highest skiing you will find in Europe. This makes spring a great time to book your family ski holiday, and not just as a way of burning off all those Easter eggs! St Martin de Belleville and the Three Valleys is the perfect ski resort for your Easter Ski Holiday. If your trip is purely about the time on the slopes then you will love the super easy access to Les Menuires and of course Val Thorens, Europe’s highest ski station. At least 70% of the slopes here are guaranteed to be open in April and are usually very well covered; everything you expect from Europe’s highest ski resort where more than 140km of the pistes are above 3,000 metres. As a lot of the pistes in Val Thorens are north facing, snow in the resort late season is some of the best in the world. If enjoying the great weather is higher on your list of priorities then you will love Saint Martin de Belleville for it’s beautiful long Blue run (the longest Blue in the Three Valleys) back to the village, that offers up some truly epic scenery and some fantastic mountain restaurants. Imagine sitting out on the sun terrace, enjoying a crisp cold glass of Rosé. Often referred to as the “Jewel of the Three Valleys”, Saint Martin de Belleville is a truly beautiful Alpine village that lends itself well to the Easter festivities and so is the perfect base for your Easter Ski Holiday. Why are Easter Ski Holidays good for families? Other reasons to favour Easter for your family ski holiday are the generally warmer weather which is better for families with young children and those looking for a sun tan (! ), and the long, light evenings meaning that ski lifts stay open later and there’s more time for family après ski and outdoor activities, of which there are plenty in the Three Valleys to keep the family entertained! 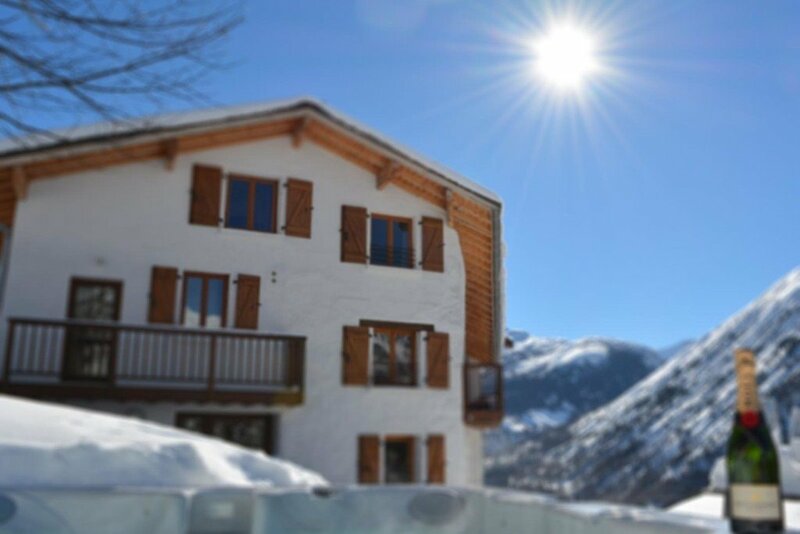 There are a few other considerations when choosing a family ski holiday destination, one of which is making sure you choose a family friendly chalet. What do we mean by family friendly chalet? Well, we’ve all been there, the children are tired after ski school and would rather sledge down the hill outside the chalet than follow you down the World Cup Black that you’ve been itching to shred since you arrived! You want to know that instead of standing around waiting for the ski bus, or trudging your way around resort in ski boots, you are going to be collected from the piste and driven straight to the front door of the chalet. Similarly, when you arrive back at the chalet you want to know that the children will be fed and entertained until bed time, leaving you time to unwind in the outdoor Jacuzzi whilst taking in the fantastic mountain views. This is an often overlooked consideration and is probably the one that will have the biggest impact on the enjoyment of your ski holiday. Which way to Saint Martin de Belleville!? Snow Trippin Catered Chalets are currently offering some fantastic Easter Ski Deals for family ski holidays in a fantastic family friendly chalet, so if the best skiing of the season and great family time are what you’re looking for then you best get in touch!